Organizations invest immense amounts of time, resources, and attention in their software projects. But all too often, when it’s time to transfer the finished project to new “owners,” they settle for the most superficial classroom training, documentation, and code walkthroughs. These conventional approaches to knowledge transfer often fail, dramatically reducing the value of new systems in production. 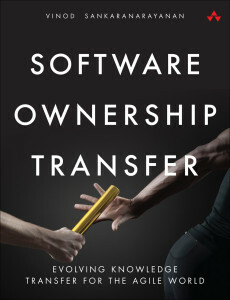 You can do much better – and Software Ownership Transfer will show you how. Download a free chapter of the book from here. Here is the ThoughtWorks page on the book. Read more about it at Amazon.